Entrepreneurship is empowering! It has enabled me to make a living while creating a life I love! Ten years after college, I was working in retail. I had dreamt of becoming a buyer. Achievement of that goal delivered the reality that the job was more nightmare than dream. Right after I turned 30, a voice in my mind screamed, “get off this path!” At 32, I put retail in my rearview. My do-over came February 1, 1996. I launched the Bolingbrook Greeters Association from my home. I authored local info guides and sold ads to underwrite printing. Looking back over 21 years, what I know to be true is that I am a serial entrepreneur. Couldn’t think of any other way to live my life. All my businesses share a communications link via the written word or visual art. Toni Ink (freelance writing) was my second venture in 1998. It opened an alternate income avenue. Under that flag, I found my voice. I wrote a weekly community column for the Bolingbrook Sun. In 2012, I pivoted to introduce Custom Community Creations, LLC (a caricature map company). That eventually led to the online biz TOONi Ink.com. Summarily, community, writing and art are my passions. GOD has blessed me to pursue a life of purpose. I spend each day alternating between those three... pouring my unique talents into each passion. Tell us YOUR Start Up Story? Its easier to explain via a metaphor. When I look back I have literally gone full circle, from retail to writing and back to retail again. Going into the Adult Coloring Book business resulting from a relentless pursuit to move beyond obstacles after being pushed off the path I’d been happily traveling. My journey was abruptly interrupted on December 31, 2010 - when the Chicago Sun Times News Group closed the access road to all their suburban weekly newspapers. For the first time in a long time, I felt directionless. TO COPE - I COLORED! Long before Adult Coloring became a national trend, I found putting color pencil to page cathartic. Coloring gave my mind permission to wander and ponder what’s next. It took a minute... more like a year... to find my footing. During that time coloring helped me grieve the loss of a “beloved” community column that had breathed purpose into my life for 12 years. Most importantly, coloring gave me the courage to rely on my inner compass, moving forward by Faith NOT Sight. 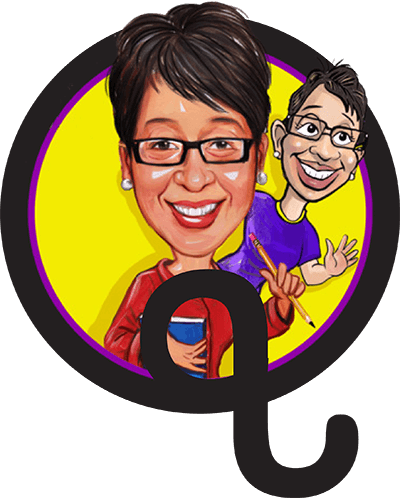 In early 2012, I founded Custom Community Creations, LLC and focused on caricature art. Along the way, I crossed paths with Don Zahorick. Don is an Army Veteran turned freelance artist who patriotically poured his passion into protecting the lost art of drawing by hand. Late in 2014, an unexpected course correction routed my fledgling enterprise to downtown Joliet, where I was offered guidance at the University of St. Francis Business Incubator. This juncture illuminated the direction of my journey forward. I boldly began blazing an unconventional entrepreneurial trail that led to the creation of three books (which are all sold on Amazon.com). 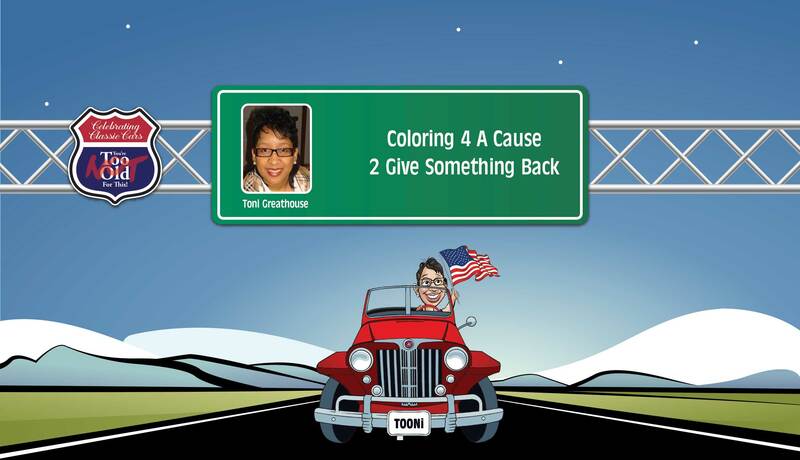 My first book, “Coloring Along America’s Highway” featuring Classic Cars on Route 66 was bought by Walmart and is sold coast to cost in 226 stores. How did YOU get into the Adult Coloring Book Business? I created a spec piece for the Joliet History Museum. As fate would have it, I stumbled across an ad in USA Today that said Walmart wants to buy your America made product. I uploaded my application and received an invitation to “pitch a buyer” at the 2016 Supplier Summit. The buyer liked the book but it took another 18 months to get them in on Walmart shelves. How does a one-woman shop do business with Walmart? Think big and take even bigger actions! Actually, my life is simply about keeping an eye out for opportunities and putting one foot in front of the other. Optimism, preparation, organization, serendipity, fate, luck and timing have also played roles in my uncommon story. Just before this whole coloring book adventure started, I’d read the “10X Rule” by Grant Cardone. The book explores setting a target that is ten times greater than what you believe possible; then exerting extraordinary effort to achieve that target. Do you have help in this process? Absolutely! The assistance of a patron of the business incubator has proven invaluable. My SCORE mentor, George Safford, challenges me by asking difficult questions. However, the road that led here would not have been possible without Joe Guinta. Joe served as a Business Analyst for the now defunct Illinois Small Business Development Center at Joliet Junior College. I also work with nine consultants who share in putting the right pieces in place to connect my business puzzle. Who do you go to for business advice? My husband David is my partner in every area of life and has a voice in every business decision. My husband David supplies the missing left hemisphere of my right brain. He has oversight for everything that pertains to finances. I run all the legal stuff by my friend and lawyer Anita Kontoh Carty. My numbers team includes bookkeeper Ruby Tan and my accountant Karen Eberhardt. Two years ago, I coordinated an entrepreneurial women’s bookclub/group on MeetUP.com and named it “So YOU think YOU want to be in Business.” We meet monthly at Fountaindale Public Library. The ladies have been a great source of support. Entrepreneurial success stories via TED Talks, podcasts or audiobooks. Books more than anything motivate me to action. I have a “best of” list and it keeps growing! Vying for first and second place are “Big Magic” by Liz Gilbert and “Steal Like An Artist” by Austin Kleon. No two days are the same, which is the reason I love being an entrepreneur! I have the freedom to pursue whatever excites my soul each day. At this point in my life, my work is project driven. I consider myself a creative consultant, so I only take on projects with clients who value my ability to think beyond perceived boundaries. I thank GOD for waking me up with a fresh flow of ideas and energy to carry them out. My creativity and ability to bounce back from missteps. What year in business stands out and why? Definitely 2015, when the Bolingbrook Area Chamber of Commerce awarded my company Custom Community Creations, LLC the “Best Small Business of the Year.” During that time, I was enrolled in the University of St. Francis Business Incubator. Their tag line - “Where great ideas are born” has a special meaning. The Incubator was the place I came up with the idea for my Avatar and Brand Ambassador TOONi and later the company TOONi Ink.com. My husband and I have raised a strong capable, beautiful, young woman who is contributing to society in positive ways. Is there a specific skill you have gained from your entrepreneurial experience? Resilience! After 21 years of business ownership, I’m confident in my ability to move past any obstacle I might encounter on the unconventional entrepreneurial trail I continue to blaze. My other “10X” project is a custom coloring book created for Ellen DeGeneres that features cats and Classic Cars. One long-shot hit - so I’m rolling the dice again! The goal is for Ellen to sell the book in her on-line store.